I fully concur with one comment made about this film in that it is a movie for upper-middle class hipsters who once fancied themselves firebrands and non-conformists in college, but now consider only buying organic food or not vaccinating their kids to be radical acts. 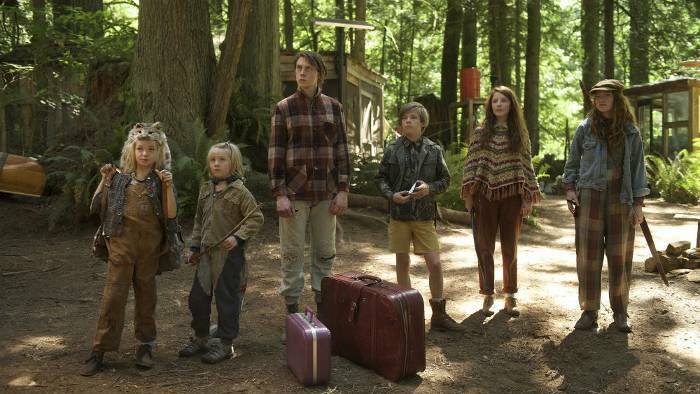 In an isolated part of a forest within Washington State Ben Cash (Viggo Mortensen) and his wife Leslie (Trin Miller) have raised six kids, almost completely detached from the ‘real world’, and home-schooled them in a bizarre and somewhat baffling curriculum. For instance one of their seven-year-old children can parrot off the American Bill Of Rights. So what! The child has no concept of what they mean. She is just reciting a list of words. That is not education. Despite living in natural terrain, open to the elements, the family all look very healthy and well dressed. To undertake and continue this so-called alternative lifestyle where does the money come from to finance it? Cash is portrayed as some sort of guru but in the opening scene he is seen congratulating his eldest son in moving from being a boy to a man because he has killed a tame stag. There are so many flaws in the film too numerous to mention. The family are forced, on a temporary basis, to transport themselves to New Mexico to attend the funeral of Trin, who has killed herself. As if in a cartoon sketch the kids are agog at the new technology children of their age are using on a daily basis and the ultra-materialism, the prevalence of obesity and the throw- away culture they witness. The movie ends in unconvincing fashion with the ‘radicals’ compromising with the straight world. I am not at all sure what the point was in making Captain Fantastic, or perhaps it should have been titled Captain Fantasy?